So, as a response to some of the comments, I thought I woud add some comments on how I cames p with the final shot here. Basically, I shot it with the kit 18mm-55mm lens. The DOF is natural not manufactured in PS. No extra sharpening beyond a bit if USM. 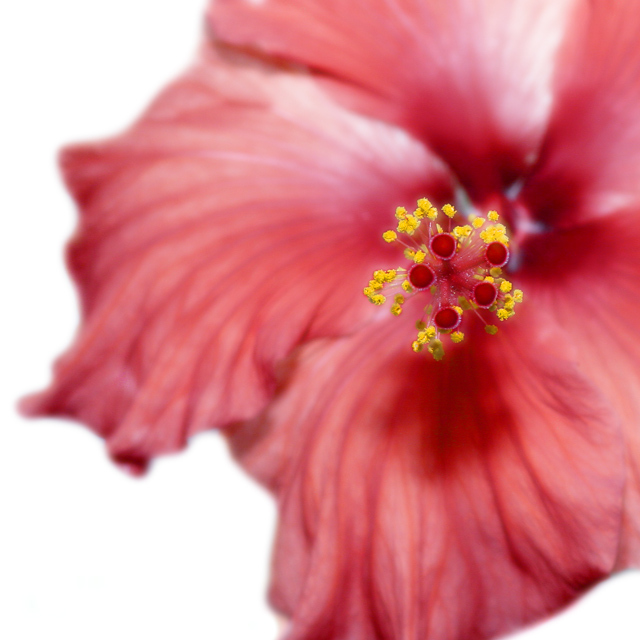 Some curves to get the BG all white & added diffuse glow, mainly bc I wanted the centre of the flower (what's it called? Alluding me right now)to stand out. After the DG, I used a ector mask & paint brush to reveal the natural colours of the centre. Of course I cropped & then resized, with a final 150kb save for web. Big ups to those that liked it enough to choose this shot as a fave. Thanks! That score is a shame. It should have done a lot better. Congrats on an amazing image. This seems to be over sharpened. I think a dark background would help. I am really torn on this shot. The huge difference in focus is unsettling to me one moment, and a bit intriguing the next. I am quite familair with shallow DOF for this type of shot, but in this case it just really jumps out with no gradual inbetween. Great colors and good use of shallow DOF. Normally a big fan of extremely short DOF I think this is a bit too short, but it´s a strong image and good colours, would be surprised to see it anywhere but in the top 90%. interesting image, the focus make the flower look almost detached with the center representing a bunch of flowers, very compelling pic - you should it into dpcprints - well done! Proudly hosted by Sargasso Networks. Current Server Time: 04/23/2019 12:04:47 AM EDT.